News & Announcements / Well, this is goodbye. For now. I tried to do this before, for various reasons. This time it's different. I am resigning from the PU writing team. I have changed my focus in life. I'm going for a career in video production and editing and looking into going back to school so I can hone my skills. I enjoyed my time here and have met a lot of amazing people. I might return sometime in the future and wish you guys the best of luck with the game. If any of you have me on Steam or Skype and want to stay in contact, feel free. My Skype name is Tickles Ticklesword. Also, feel free to look into my channel, as I will be posting some gameplay vids here. Since the last last post wins was won by yours truly (go check, it's a fact). I decided to start it anew. Can I hold my title once more? Note, all profiles are to be PM'd to the GM. All profiles will be documented here. Follow these guidelines for completing your profile. -You weapon must have existed in the real world. [b]Height:[/b] Realistic Height. No more than 6'3"
[b]Weight:[/b] Realistic Weight. Yes, you can be slightly overweight, underweight, but not in a way that makes no sense. [b]Habits:[/b] Things your character does without thought. Can be good or bad. [b]Biography:[/b] Life story. Must be two paragraphs in length minimum. [b]Appearance:[/b] For reason I do not wish to explain, please use an image from google or your favorite image site. I want a quick reference for RPers here. [b]Abilities:[/b] You start off with one, low level ability. You will gain more at the GM's discretion and through progression through the RP. If this field is left blank, the GM will give you an ability. DWMA, a school for meisters and weapons has expanded outward, creating an identical school on a remote island located in the Pacific. The reason: Lord Death has been receiving an extreme amount of applications in the past few years, and the old school is starting to get crowded. In an interview with the Shinigami, he stated "My establishment has been around for centuries, training warriors to fight the Kishin threat, teaching the three R's: Reaping, Raising, and 'Rithmatic, and above all protecting the lives of mortals across the globe. Death city simply does not have the room to house all of these applicants. That's when it dawned on me. Open a new school! With a new town! And now, six years later we have an exact copy of the city and school." The school's headmaster will be Carter Faehald along with his weapon Merlin. He had this to say at the grand opening. "I hope to lead our first years into the path of greatness. Though the school may look the same as the former, I plan to take it to greater heights. I have selected an elite group of faculty, all regarded in their fields to take on the task of enlightening these young minds. If any of my potential students are watching, be warned: You have only to realize your true potential. I will see you all soon." Will the new headmaster be able to live up the the DWMA's reputation? Who will these new students be? We will be watching closely as events progress. Stay tuned! Plot You will be playing a pair of students (or student if playing a lone weapon) at the new DWMA. Each day you will be dealing with classes, and some nights missions. Your goal is to raise your weapon to death scythe level by collecting 99 kishin eggs, and one witch soul. During your time here, you might see the rise of a greater threat, or you might not. -You must write a full paragraph per character, or two paragraphs per post. You have two characters, you will be able to achieve this. You will receive three warnings before being kicked from the RP. -In the case of lone weapons, you must have two lone weapon profiles to adhere to the previous rule. -You have a maximum of three days to respond to any post. No response after the third day will result in being kicked from the RP. This will be excused so long prior warning is given for any prolonged absence. -All arguments are settled by the GM. This will be enforced. Further note, all arguments are to be held in the OOC thread of the RP, unless the argument is dialogue by characters. -Your character has a life in this world. That means maintaining a schedule that makes sense for them and the environment around them. This means READ ALL POSTS IN THE RP. This will prevent confusion for the most part. -Have fun. Rules are meant to be a framework, but you still have freedom to write in any style you wish. -Extra thing: Everyone must claim a color to use for dialogue. No copying anyone's color for their own character. It's been a few years since I hosted an RP, and joined as well. Bear with me, even I can make mistakes. As most of you know, The Stranger is a character I came up with for the game. However, I decided to show you guys that I use him in pretty much anything I can write, since he fits about anywhere and in mot jobs. This is a story of one epic hero's encounter with the strange fellow, who may or may not be a representation of my mind. Also, I am bored, and want to be creative, and see if I still got the talent for this. Iron Strongarm, a warrior of many talents, who holds titles such as "Orc Crusher", "Mountain Eater," and "Sewing Champion of 2279" is about to face his next chalenge, to slay the evil Dr. M. His eyes ablaze, he set hs sights on his foes floating ship, now stationary in the middle of the Death Dessert. Out of nowhere, a voice rang out, "Hold on there stranger, you look like you're about to face a powerful enemy. Might want to reconsider, you do not look ready." "Who the hell are you to say I'm not ready. Do you know who I am?" Iron spoke as he started down the tiny man beside him, unimpressed by the words, nor giving the slightest caring for this creatures well being. "I just called you stranger, so obviously not. For a large man, you seem to lack the brainpower for the challenge ahead." The tiny man took a seat in a chair that also appeared from nowhere, and had a large mug which smelled of strong coffee. "You may call be The Stranger, stranger." "Wait, if you're calling me a stranger, why are you named the stranger? Why can't you call me sir, or better yet Iron Strongarm." "Because you're still a stranger, and I practice stranger danger." This made Iron's head spin. Probably another wizard who talks like he knows everything, but this man didn't look like one. He wore a rogue's outfit, but no weapon, even with his jacket open Iron was able to notice this fact. "How did you get out here without a Cannonsword? You don't look like the type to fight." He stared into this man, until a literal hole appeared in his body. 'Watch that gaze, you might see more than you need." Iron jumped in shock, was this man some kind of zombie instead? "No, I am no zombie, nor wizard, nor rogue. Just a stranger talking to a stranger." "ENOUGH WITH THE WORD STRANGER!" "Someone's impatient. Well, your burning question seems to be why I said you're not ready." Iron nodded. "And you wish to know why I said that." Iron nodded, but a little frustrated. "And you inquire why I would make such a claim." 'DAMMNIT GET TO THE POINT!" The Stranger held out a hand to calm the beast, who's heavy breathing drowned out the few noises around them. The stranger leaned back in his chair, which was now a recliner for some odd reason. "Simple, you're too stupid to face a technomancer. How can you face him when you can't even see past me?" "So you work for him? Very well, I will slay thee to prove I am ready." The stranger appeared behind Iron and leaned close to his ear. "I am no ones servant, nor do I have a job." Iron nearly jumped out of his skin. How was this man able to perform such feats without magic? He kept thinking to himself that this must be Dr. M's doing, some kind of illusion to disorient him. "I'm not an illusion eith..."
"KNOCK THAT OFF! How the hell can you tell what I'm thinking?" "Simple, it's written on your face, see?" The stranger held up a mirror, also out of nowhere, and Iron read on his face "You are now thinking about where this mirror came from, and where this writing is coming from, and oh god why can't I stop reading it." Iron shook it off once more. "Listen stranger the things I do are not explained easily. What I will tell you is that you need to do a bit of research, which I have compiled for you in the thirty-six hundred page dossier on your foe. Inside, you will find his weaknesses, resistances, likes, dislikes, and schedule, along with..."
"I refuse to read something that big. Is there a shorter version on you?" "Have you tried checking his eHarmony?" 'Why would I do that?" "Because he says his weakness is women who are strong willed and occasionally give puppy dog eyes." "That seems more like a preference than an actual physical weakness"
The strange laughed at his own joke. Iron just stood there, perplexed at this vaguely terrifying man. He drew is Cannonsword, and placed it at the strangers face. "See, this is what I'm talking about stranger..."
"Say stranger one more time, and this dessert gets painted with your brains." Iron pulled the trigger, launching a sword through the man's skull. With that done, he moved onward to the ship, which landed on Iron, killing him instantly. The Stranger, sitting in his chair, simply looked on. "Nice knowing you stranger, at least you had a quick death." The stranger walked into a portal, ready to chat with the next imbecile he finds. Maybe this one will prove to be much more entertaining. Comment or don't don't really care. Kind of a one off story. -You are allowed up to 3 characters at once. Your main character must be a human, and you are allowed 1 animal/robot profile, and that profile is a companion character. -You must start off in your factions location. If faction less, you must start in a neutral location. Wastelanders may start anywhere that isn't a faction base. -You may choose any weapon from this list: http://fallout.wikia.com/wiki/Fallout:_New_Vegas_weapons. You are not allowed to have unique weapons, and your weapon will start off in a poor state. Your weapon may break randomly during the RP, so beware. -You may choose any armor from this list: http://fallout.wikia.com/wiki/Fallout:_New_Vegas_armor_and_clothing, except power armor(can be obtained through special means), and unique armor. Your armor starts in poor condition, and has a chance to break. Also note that the size of the armor can decrease speed. Add these factors to any armor, along with that armors usual stats. Example, Leather Armor gains the +1 endurance, and Metal Armor gains the +3 endurance, and -3 agility. -S.P.E.C.I.A.L Can only have a minimum score of 1 and a maximum score of 10. Traits and perks will not help you breach these limits. For example, taking the claustrophobia trait with anything at a score of 10 will leave it at ten. -Trait effects are applied after you distribute your points for your scores. this is represented by adding a + or - next to your score after distribution, or memorizing what the effect does under certain situations. Strength- The higher this number is, the stronger you are. This ties into combat as it allows you to carry heavier weapons, hit harder with melee and unarmed attacks, and as well as how much you can carry. It also ties into a lot of minor details, like moving heavy objects, forcing a door open, or whatever requires physical power. Perception- The higher the number, the more you can see or hear (does not affect sharp eyes trait.) You will be able to detect enemies before they see you, identify distant objects, and even detect nearby traps. Endurance- The higher the number is, the more damage you can take before you go down. It also affects how musc you can run, how much physical activity you can do, how long it takes you to get hungry or thirsty (does not counter fish gills negative effects), and your resistance to the harsh desert environment. Charisma- The higher the number is, the more people like you. You just have a certain magnetism about you that makes enemies more likely to leave you alone. Not the same as speech or barter, but related to them. Intelligence- The higher the number is, the smarter you are. It governs how much knowledge you have, and can come in handy in tough situations requiring brain power, such as identifying the types of enemies you face, solving complex puzzles, and event coming up with plans. Agility- The higher you are, the faster you can go. This is not limited to running. It can also greatly improve your reaction times to situations, the speed at which you can draw a weapon, or swiping an item from someones pocket with fast hands. Energy Weapons- Proficiency at using energy-based weapons. Explosives- Proficiency at using explosive weaponry, disarming mines, and crafting explosives. Can be made a passive skill to use explosives as tools (NOT WEAPONS). Guns- Proficiency at using weapons that fire standard ammunition. Melee Weapons- Proficiency at using melee weapons. Unarmed- Proficiency at unarmed fighting. Barter- Proficiency at trading and haggling. Also used to negotiate better quest rewards or occasionally as a bribe-like alternative to Speech. Lockpick- Proficiency at picking locks. Medicine- Proficiency at using medical tools, drugs, and for crafting Doctor's Bags. Also governs how well you can heal others. Repair- Proficiency at repairing items and crafting items and ammunition. Also governs how well you can take apart things without breaking them. Science- Proficiency at hacking terminals, recycling energy ammunition at workbenches, crafting chems, and many dialog checks. Sneak- Proficiency at remaining undetected and stealing. Also governs how well you can conceal items, poison an enemy, and disappear into a crowd. Speech- Proficiency at persuading others. Also used to negotiate for better quest rewards and to talk your way out of combat, convincing people to give up vital information and succeeding in multiple speech checks. Built to destroy- You are a tornado of destruction. You get slightly more critical hits, but your weapon has more of a chance to break. Fast shot- You have lightening fast fingers, and can fire any weapon faster than most, but at the cost of accuracy. Four Eyes- While wearing glasses, you gain +2 to perception, but -1 without them. Visors on helmets do not count as glasses. Good Natured- Your passive skills both count as Major Passives, but your weapon skill becomes minor. Heavy Handed- You can hit harder with your fists and melee weapons, but you can't score a critical hit with them. Kamikaze- Your agility increases to 10 while in combat, but you take more damage from attacks. Loose Cannon- You can throw anything faster, but you can't throw them very far. Small frame- You gain +1 to agilty, but your limbs are crippled easier. Trigger Discipline- You are more accurate with your weapons, but you can't fire them as fast. Early bird- +2 to all attributes during Morning and Afternoon, but -1 to all during Evening and Night. Hot Blooded- You do more damage when you are at half health, but you lose 2 agility and perceptions when at half health. Logan's Loophole- Chems last twice as long, and you will never become addicted, but you can only have one passive skill. Skilled- You gain an extra passive skill, but you lose one point to all attributes. Sharp Eyes- You can see easily under any condition, including the dark, but you have poor hearing. Fish Gills- You were born with gills, allowing you to breathe underwater, but you get thirsty more often. Lead Belly- You can drink dirty water and eat irradiated food with no problem, but you need more to satisfy your needs. Hoarder- You can carry more items than normal, but you need to carry at least 10 items or lose 1 point in all attributes. Gifted- You gain 2 point in all attributes, but you have no passive skills. Cannibal- You can quell your hunger by feasting on your kin, but you will be considered an outcast from all factions. [b]Job:[/b] What you job is. If you can't decide, the GM may provide you with one. [b]Traits:[/b] Choose up to 2 from the list. You may choose none. [b]Skills:[/b] Choose a major skill and two minor skills. Your major skill is the one you excell at the most, while your minor is one you are good at in one area. See notes for details. [b]S.P.E.C.I.A.L:[/b] All scores start at 5. You get 5 points to spend. You can trade off points for higher scores(See notes). [b]Items:[/b] Choose a starting weapon and armor. GM will grant you other items at their discretion. [b]Bio:[/b] Must be at least two paragraphs long. The more in here, the more you will be able to develop your character. Go all out. [b]Appearence:[/b] You may describe a character, but an image will work. Try for something gritty, as Fallout is not clean and pretty. [b]Notes:[/b] Anything extra you want to mention about your character. Every last detail of the RP is here. PM the GM, or post here if you have any questions. The New California Republic. Once a superpower in the Mojave, they have made a comeback to reclaim territories, and try to bring a fair justice system to the chaotic wasteland. They prefer to use diplomacy to settle disputes, but are not afraid to use force. They resemble the former U.S Government, but are more open minded to new ideas. The Enclave. Remnants of the former U.S Government, and once the defining law throughout the Capitol Wasteland. They utilize any and all old war tech to expand their empire. Recently, they have risen from the ashes of their former glory, and wish to take the Mojave for themselves to establish a stable foothold, and eventually retake America. The Legion, slavers and followers of their true king. They terrorized the Mojave in the past before Courier 6 defeated them at The Battle of Hoover Damn. With the recent death of the courier, they have returned to expand their territory once more. They are the most ruthless, and highly disciplined. The Talon Company, mercs of all types that want one thing: money. They see the Mojave as an investment, and commit crimes of all sorts across their territories. Though they do not have a formal law, they prefer capitol punishment for any trespasses, no matter how small. Everyone in the faction has a price. Citizens of the Mojave that prefer to travel around the wastes. Some are highly successful scavengers, while others have died in the harsh environment. They have no loyalties but to themselves. Doctors and good samaritans, they provide medical facilities across the wasteland. They despise the major factions for causing chaos in the wastes, but are never likely to turn anyone away, save for the Legion or Talon Company. They are interested in pre-war tech to research new medical practices. Their major compound is located in Freeside. The Kings follow the way of Elvis, emulating him in every aspect. The most notable impersonator is The King, who talks, walks, and looks like their pariah. Though they seem more of an entertainment business, they are in fact a gang that controls Freeside, and will fight off anyone that tries to cause trouble in their town. Travelers that commit charitable acts within Freeside are usually rewarded by The King himself. A small town consisting of ranchers and simple folk. They want no part in the war, and just want to maintain their way of life. Their biggest export is Bighorner Meat and fresh water, and are one of the few towns that has a school. Sunny Smiles is the new Mayor of Goodsprings, and she helped establish a simple judicial system that is founded on truth, compassion, and freedom. Multiple small groups of people that are willing to kill and steal. The only option is to eliminate them when encountered. Most are known chem addicts. An old train staion that has been converted into a military base, as well as the home base for the recent president. Vertibirds can be seen on the back lots and the front grounds are littered with tents and firing ranges for the soldiers to train at their leisure. The monorail that connects to the strip is located here, but remains out of commission since the last conflict at Hoover Damn. The NCR have recently took control of Aerotech company, and are using it as a makeshift storage facility. It is guarded round the clock. Inside are a large amount of weaponry, medical supplies, and food. A former raiders den, the south vegas ruins have been cleared, and the NCR have set up an outpost there. There are plans to explore the ruins further to see if any raider stockpiles exist, but the low light conditions and gas leaks have made it near impossible without the proper gear. The town of Westside was once a poor, almost known town in the Mojave. Since they joined sides with the NCR, they have seen a large economic boom. The two hotels located within the town have gone from brothels, to near luxury resorts (though you can still find a bed maiden if you wish). Anyone who works for the NCR goes here to work a small job, relax, or shop for new items. The entire town of searchlight was once inhospitable due to radiation levels but it recently wore down, and life can flourish once again. Located here is an old firehouse, police station, church, and enough houses to fit the Enclave's needs. Nearby is the airport, which serves as the Enclave's HQ, where the radio equipment constantly churns out Enclave Propaganda, and is home to their Vertibirds and laboratories. A former Legion settlement that was abandoned after the Last Battle of Hoover Damn, the enclave have took up residence here, destroying anything resembling the legion, and converting it into a water treatment town. Fresh water can be aquired here, but only with permission from Enclave Officers, or having the right forms. An abandoned settlement that the Enclave have turned into a supply town. The multiple buildings house all kinds of supplies, from pre-war tech, to food. No one but Enclave soldiers are permitted here, and trespassers will be arrested or shot on sight. The Enclave discovered this area hidden near Novac, and have staked claim here, analyzing all the pre-war equipment that lies inside. Signs seem to point to it once housing ghouls, but they have long since disappeared. Currently, they are deciphering old blueprints in hopes of creating a new weapon. Once, and still is, the main base of operation for the legion. They send their troops out by cover of darkness on rafts to venture into the wastes. It is the largest settlement in the Mojave, and is said to house hundreds of legion soldiers, as well as slaves. Training grounds, a fighting pit, a slave pen, and even the current emperors quarters are located here. Infiltrating this area is extremely dangerous. A former NCR training camp, it now belongs to the legion. They have converted the entire base to serve as a training ground for new recruits. The conditions here are harsh, but it is relatively easy to infiltrate since the majority of residents are young men looking to become soldiers. This only serves as the legions connection to the wastelands. Undercover legion soldiers act as regular people who will sell random "junk" to strangers, while smuggling soldiers into the wastelands at night. Acting as resort town, this is home to many legion spies. They can easily keep track of the NCR from here, as well as keep notes on the other factions throughout the Mojave. People from all over come here to relax and enjoy themselves. It is not unheard of for people to disappear though, but rumors suggest that they may have drowned in the nearby waters after refusing to obey the NO SWIMMING signs. Though smaller than the other faction bases, it serves Talon's needs well. They have established trade routes between their major territories from here, and even equipped the place to serve as a training facility. Mercenaries can come here at their leisure to get missions. The Talon Company kept this town as small vegas, leaving the Viki and Vance casino running, and even renovating the Bison Steve Hotel. The Mojave Express was taken over, and only serves as a supply network for the other territories under the company. Talon Company loves to take captives when it can, uses this town to house them. A large fence was erected around the town, and POW's from all factions can be found here for numerous crimes ranging from "looking at an officer funny," to "refusing to dance when I shot at his feet." Life here isn't as bad as being a prisoner of the Legion at least. A strategic foothold, the company has taken Sloan and stopped all shipment of concrete from the quarry. Instead, it is now a checkpoint, and people that wish to pass by to get to the strip must pay a hefty fine, or are turned around and sent where they came from. It is then fastest route to the stip as well. Freeside- Both factions have a mutual agreement, and Freeside remains a nice residential town, with direct access to the strip. Though it was formally home to those that struck out on the strip, it is receiving aid and is experiencing a well known economic boom. Residents report it being a lot safer than usual. The raiders, being pushed from their usual spots, have taken up residence here. The area is considered lost, and no one dares to enter. Raiders can still be found throughout the wasteland, in the numerous ranger stations, utilizing them to ambush passerby. Goodsprings- An old west style town, it sports a Saloon, a School, a General Goods Store, and a few houses. There's not a lot of resources here, and the residents are well armed. Novac- A refugee town, home to many that have displaced by the recent faction conflicts. It is overcrowded, and residents are genrally miserable. Jamestown- One of the few locations to have peaceful super mutants, it has no resources whatsoever, and serves as a refuge spot for lost travelers in the mountains. Hidden Valley- Nothing exists here, at least, to the naked eye. Black Mountain- Once a place crawling with dangerous super mutants, it is now a highly radioactive ghost town, with one radio station that only plays white noise. Repconn HQ- A home to dozens of robots that gained sentience. They prefer a peaceful way of life, and have since gotten rid of all their resources, save for parts to repair themselves. Any and all vaults are home to unknown treasures, but are considered dangerous to venture into. Few have gone into these underground labyrinths, and none have returned. Have the found fortune and left to a beter way of life, or did they all meet a deadly fate? Twenty years after The Legion was defeated at Hoover Damn by Courier 6, and the NCR was told to leave the Mojave, the two factions have returned to reclaim what they believe is rightfully theirs. Scattered armies began to take hold of territories across the Mojave. These were just the beginning of the new struggles that faced the untamed west, as the rise of the Enclave meant increasing their influence. Talon Company piggy backed off of them, and seen a vast land with new opportunities for making money. A faction scuffle ensued, territories were won, and enough blood was spilled to paint the desert red. All sides came to an agreement to leave territories as is, and the Mojave Treaty was formed. But tensions would rise once the single most valuable resource, energy, would be wanted by every faction in The Mojave, and a faction war is on the horizon once again. Take the role of a citizen of one of the many factions, fight for survival, and win glory for your people. Or take on the role of a Wastelander, living by your own rules, and taking no masters. You do what you must in a near lawless wasteland. That is how things go in this world. -There is a day/night system. During the day, it will be really hot out. It never rains in the Mojave thanks to the nuclear bombs. During the night, temperatures will drop to freezing levels. It is advised you prepare for this drastic shift in weather wherever you are. -Trade uses the value of what you have on hand. Caps are hard to keep track of in an RP, so you must find items to trade for more items. Merchant's can be found in every major town. - You must eat and drink regularly, and get enough sleep. If you do not, your characters health will deteriorate, and their actions may become more sluggish and dangerous. Further refusal to meet these needs may result in death. -Your S.P.E.C.I.A.L. combined with your skills will determine how events will turn out. The GM is the only one that can make these happen. -Factions tend to hate each other, but are at a mutual agreement not to attack each other for fear of annihilation. If you kill anyone belonging to a faction, you are automatically hated by that faction until evidence can prove it was not a random occurrence. -All posts are required to be a full paragraph, or four complete sentences in length. Dialogue does not have to be a complete sentence, but it must make sense. Any post that does not meet this requirement will be requested to edit. Refusal to edit will result in either a mod making the edit, removal of the post, or being kicked from the RP. -GM events will be given out to players with very little information. This is to leave room for creativity. If the GM says that you wonder upon a locked container near dead bodies, you have a choice to make, and you must meet the post requirement. -There will be no post that says "I wait for my foes actions." This can drag on an event for far too long. You must make a valid action for your foe to respond. For instance, you get shot at, you take cover, reload your gun, and return fire within a couple posts. You do not take cover, then wait. The GM has all right to skew an encounter to force you to make a valid action. -You must keep a "Backpack post" in the OOCC. This post will contain all items you find throughout the RP. You must keep this up to date. Copy the link to your post so you can edit it regularly. Intro: Venusaur is a large reptilian pokemon with a flower supported by a trunk on its back. It is one of the few pokemon able to Mega Evolve. Diet: Just like its previous evolutions, Venusaur only needs sunlight for photosynthesis. It rarely consumes any berries, as the flower on its back provides sufficient nutrients on its own. Habitat: Venusaur live in open grasslands where there is the most sun. They have been known to venture into forests for a special ceremony for evolving Bulbasaur and Ivysaur. Biology: Just like the first two evolutions, the plant on Venusaur’s back has evolved from bulb to full flower. This, along with its large size, makes it a very slow moving pokemon, but its sturdy legs gives it tremendous strength and defenses. Venusaur has very few predators thanks to its large size and fierce appearance. A common misconception is that only female Venusaurs have a seed, which is visable at all times on the top of its flower. Further studies have confirmed that male Venusaurs do have seeds, only smaller, and in large quantities. This makes it easier for male Venusaur to place the seeds on multiple bulbasaurs’ backs. The female’s seed seems to have an effect on the surrounding environment, as well as play a hand in an evolution ceremony for Bulbasaur and Ivysaur. Only a handful of these ceremonies have been observed. The disposal sack on a venusaur is replaced with a few toxic glands, as Venusaur does not require the nutrients from berries for health, thanks to moves like Synthesis and the combination of direct sunlight collected by the flower, which is sufficient enough to sustain a Venusaur. It is uncertain why Venusaur reacts to venusaurite, and why it Mega Evolves. Further research is underway. Due to this pokemons rarity, this pokemon has been categorize as a Class B Pokemon under the Endangered Pokemon Act. Under this classification, this pokemon is obtainable through evolution, with very few in the wild. They are under the list of available pokemon to use in battle, but only a few per year are allowed to be caught in the wild due to rarity. The hunting of this pokemon is prohibited, and punishable by a 100,000 goldz fine and 15-20 years in prison. Furthermore, any attempt to interrupt Evolution Ceremonies is considered a cruel act against this pokemon. Notice how each one has a nice little text in the biology? This adds more depth of character to each pokemon. You will have to show creativity to add more to the biology. As evolution grows, so does rarity, depending on the pokemon. So, Caterpie and the evolutions tend to stay in the same class, where as the starters increase in classification. So, if a pokemon is pretty rare on its own, the evolutions would be even rarer. Pokemon #, Name, Species (For example, Pikachu is called "The Mouse pokemon"
Habitat: Where they live and why. Do your research guys. Class D- Common Pokemon. No strict catching guidelines. Class F- Uncommon. Only obtainable through special means, such as trades, stones, etc. Diet: Bulbasaur need only direct sunlight and water for photosynthesis, but they have been known to eat berries mainly for their natural healing properties, as well as changing it into a compost like substance to help sustain the bulb. Habitat: Bulbasaur live in grasslands and forests with substantial sunlight. These areas meet every one of their dietary needs as well as provide proper camouflage from predators, such as Pidgey and its evolutions. Pokemon and people alike can have a hard time locating a bulbasaur against a bush. Biology: Bulbasaur are a combination of grass and poison types. They can use a variety of close combat attacks, like tackle and body slam, as well as ranged attacks shot out from the bulb, like leech seed and sludge. The bulb on the back seems to be its primary form of defense, and can fire any of its attacks with great accuracy. They usually hunch down on their forelegs and extend their longer hind legs to assault predators and opponents directly in front of them. This pokemon is covered in scales on the animal parts of the body, and can even regrow lost or damaged limbs. These are evolutionary features more commonly found in other reptilian pokemon, though its cat like appearance often has it mistaken for a mammal. Inside the abdominal area is a special sac where a stomach should be that turns berries into compost and mulch. This seems to help with the bulbs growth along with photosynthesis. This sac, known as the disposal sac, may also be source of its poison typing as it is filled with rotted berries of varying properties. Due to this pokemons rarity, this pokemon has been categorize as a Class C Pokemon under the Endangered Pokemon Act. Under this classification, this pokemon is to be distributed to new trainers as a potential starting pokemon for its ease in care and high breeding capabilities. Any Bulbasaurs found in the wild are allowed to be caught, but in limited quantities. The hunting of this pokemon is strictly prohibited and punishable by a 100,000 goldz fine and 10 - 15 years imprisonment. 1. You must post this as a new topic with the title "[Pokedex Entry] Pokemon Name"
2. Once a pokedex entry is selected, you can't submit anything on that pokemon. There will be a list of pokemon on this thread with the links to the entry. 3. Your entries must be thought out and sound scientific. You may make up terms (such as the disposal sac for bulbasaur). 4. Of course, starters and their evolutions are off limits. I am working on those myself, and might even write a few more after that. I wish you all luck on this task. There are 700+ pokemon to make entries for, and this is not a job anyone can do alone. Topic is locked to prevent posting here. You must make an entry a new post. This thread is for any potential mappers out there. Below are our rough maps for the beta, and we want you guys to submit your work on them. I wish you all luck on this. 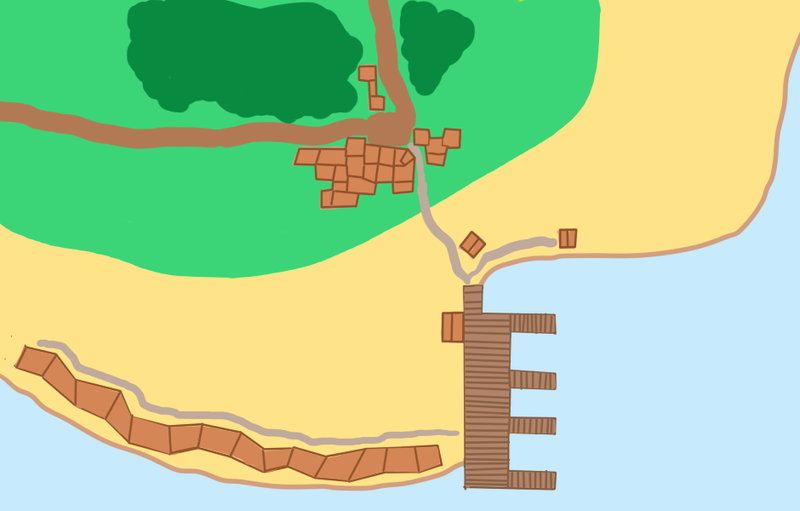 This is the starting town, situated in the south of the island on the coast, it was the very first settlement in Miryus, due to the large bay which made it an easy place to land. It is a small, cosy town where the inhabitants make their living off of the large numbers of new trainers and small amount of shipping that goes through the town. It was originally an all wooden town, however as the it grew, modern, brick and glass buildings were built further inland. A few older, wooden buildings, including the bar, are still present along the shoreline. It is well known across the region as a laid back place, making it particularly attractive to surfers and fishermen alike. Despite the fact that the surfers complain that the recent pier and docks have reduced the wave size, and the sailor's complaints about the surfers getting in the way. In the town centre, a small square can be found, with the pokecentre and mart to the west, housing to the east and south, and the main road out of town to the north. If you were to follow the coast round, you would soon come to a small collection of fisherman's huts. A - This is where the player starts. A gravel path leads into the main town. Into the sea is a modern pier, though still wooden. B - The main town, mainly housing, although a few shops selling odds and ends are scattered about. C - Fisherman's huts. Most are old and rotten, though one is still used. Rockbound Village is given its name due to the large jagged rocks protruding out of the water, and is located due west of Port Ouro. It is located by the clffs and is a prime location for rockclimbers (not hikers) who climb to the bottom to get a better view of Kyogre's teeth. The town has no Poke mart, but has a pokemon center. The other houses are random homes except for the large building, which will be explained below. One of many Storage facilities, this one is home to excess trainer products and is guarded round the clock. Guards on break are always itching to battle. This can be the first gym for players to go take on if they wish, and for the sake of the beta, have a sign that says the gym leader is on vacation. I was thinking of having this become an ancient court, where the natives from long before used to battle. 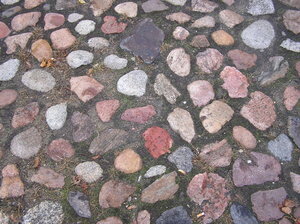 Trainers can still be allowed to battle on these grounds, but instead of a chalk looking outline, it can be lined with rocks in a decorative way. A small cave filled with low level pokemon, mainly water types and the famed zubat. It can be 1-3 floors deep, with the bottom level containing pearls from time to time. More for decorative purposes, I'm not suggesting making Kyogre appear here. B- The lumberjack's house, or woodcutter, whichever sounds better. C- The Town center, which is more like a gathering place. Left empty to add things after, or to suit some quests (Potential spot for Monimex Building.) Also going with the whole underdeveloped look. D- Lots of space for trees, and maybe tall grass to find pokes, also potential areas for the transformer and cell tower. E- The trading post, which is a good distance from the town due to the locals not wanting too much commercialization. Figured it could be a monimex trading post that can help kick start the quest. The branching path from the top left path leads to the hill for the electrical quest. I figured we could just let kamaran know about that since it is a small addition, and should be far enough to estabalish a connection to the village, and on higher ground. Or we can use that clearing to add the hill and have the quest marked there. Declan's Thoughts: Okay, here's my input. Firstly, for a name what do you think of Hutan Village? Hutan is Malay for Forest. 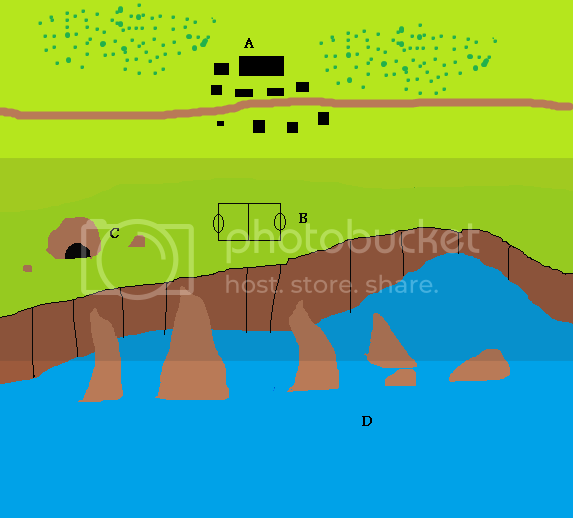 Secondly, I think there should be a small clearing, with a dirt floor in the centre of the town with local amenities. 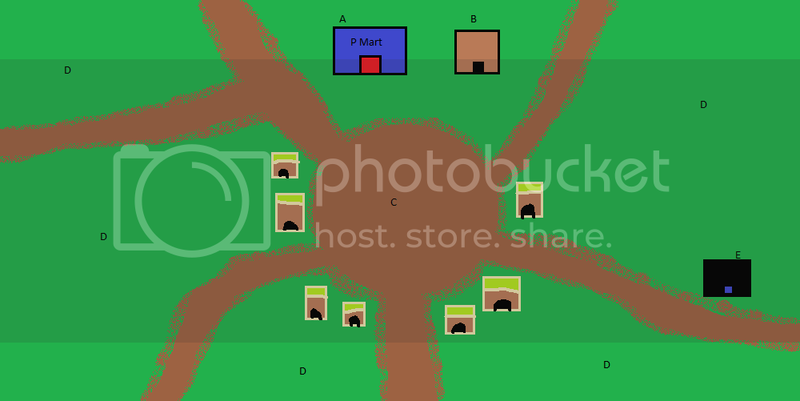 As it's quite an isolated town, I think a combined hut for the poke centre, post office and mart. Another building that could be present is a trading post. This is where the lumberjacks that live in the town come to sell the wood they've chopped down, could also be used as a place to sell wooden furniture if player houses are eventually introduced. Next off, the personal huts of the inhabitants are spread out down narrow paths from the centre, I'm thinking that they should look pretty temporary. Not quite a camp, but not quite an established town either. Aside from lumberjacks, there could be hunters, explorers and of course bug catchers. The town itself should be situated in a lightly coloured forest, and situated on a crossroads with say 5 or 6 paths coming out (Pretty much what you already have). Some of these paths will lead to other towns, whilst others lead you deeper into the forest which becomes more dense and much darker as the player travels along them. Pronounced fuhl-juhnt, it is meant to mean luminous or dazzling. Before I get into the details, I felt as though the fourth town should be the center for everything on the island, though not located in the center of the region. Theme: Large city, lots of tall buildings, meant to be the main town sometime after the starting town. ~Town square- Like a fountain surrounded by NPC trainers, located in exact center of town, all other buildings around that. ~Bulletin board- For announcements, ads and the like. Possibly be used by players to post trade requests, battle requests, etc. Story: Fulgent City was built as the trainer capital of the region, as well as the prime location of the Pokemon League Commission. It was built atop a desolate wasteland where no Pokemon dared to take residence. The city thrives by attracting trainers from all over, who wish to enter the official league challenge, as well as tourists who enjoy watching battles in the town square. The trainer academy offers refresher courses and battles with beginner trainers. About the PU dev team offices, I felt as though we should have our own building with clone NPC's of us for players to interact with. These NPC's would not battle, but would contain dialogue that each team member would have them say, as well as look like how the team member wants them to look like. They would get the top floor of course, but this is just a small idea that really has no other purpose but to make things look nicer. Feel free to add any suggestions, or any tiles or objects I may have missed. This give you guys a rough idea on how big the region is, and what is where. Again, good luck, and please post your work here, even if its halfway done. Also, interiors are welcome as well. Use your imagination guys. 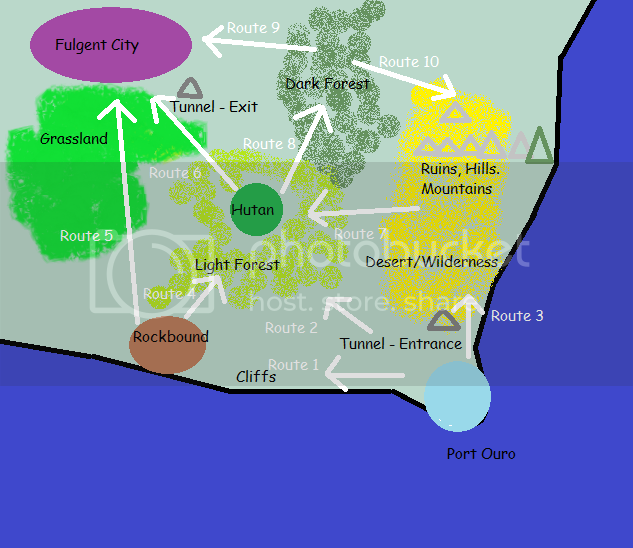 Yuki EDIT: Port Ouro map updated. Yuki EDIT2: Rockbound Village map updated. This is a quest written by fuzzy's girlfriend. They posted it in motivation thread, so I moved it here. Let her know what you guys think. Chariza is a sad girl who’s mother is sick. Someone told her that there is a shrine with good luck fortunes. Unfortunately the shrine is placed on the other side of a canyon and she cannot cross it. She hoped to get a Charmender that would one day become a Charizard so she could fly over the canyon, but she got a Bulbasaur. In the same town, you meet a Bulbasaur. He’s quite sad. You ask him to join you for a bit. He nods and seems a bit happier. He starts following you, but does not join your party. When you near the canyon and talk with the Bulbasaur, he says “Bulba.. Bulbasaur.” and shoots out his vines so you can cross the canyon. On the other side is a plateau with a small patch of grass (and a rare Pokemon) and a good luck shrine where you can get a good luck charm. When you go back to the other side of the canyon and talk to the Bulbasaur, he pulls his vines back and says “Bulbasaur. Bulbasaur! !” He takes the good luck charm from you and starts following you again. When you go to the house of Chariza, the door opens and Bulbasaur walks to Chariza. You follow him. Bulbasaur says “Bulba! Bulbasaur!” and gives Chariza the good luck charm. Chariza becomes happy once more and thanks Bulbasaur. She asks if he wants to join her again. Bulbasaur nods and walks so that he stands beside Chariza. Chariza gives you ‘Chariza’s Rope’ as thanks. Her mother didn’t want her to do dangerous things anyways. “Bulba.. Bulbaa...” It still sounds quite sad. Bulbasaur jumps in front of the door and starts to cry. It seems like he doesn’t want to go in. You should go somewhere else. When the house opens, Bulbasaur walks to the girl and the player follows Bulbasaur. Bulbasaur stops following the player and walks, so that he stands beside Chariza. Chariza: And thanks, ‘Player’s Name’. I hope that this rope will help you in your adventures. My mother doesn’t want me to do dangerous things anyways. Bulbasaur pull his vines back. He says: “Bulbasaur. Bulbasaur! !” and takes the good luck charm from you. He starts following you again. 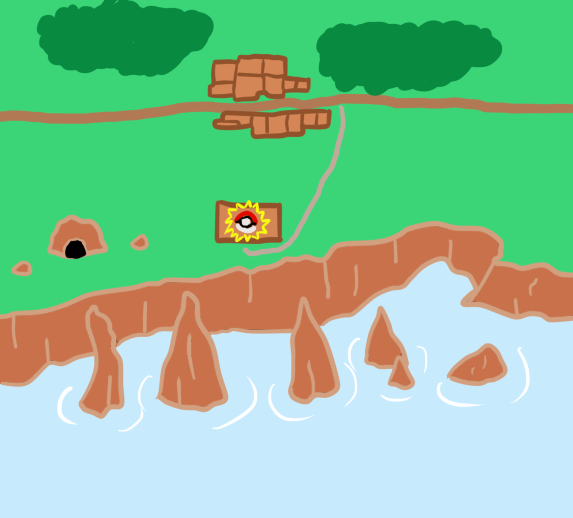 Small plateau with a path of grass and a shrine with good luck fortunes and a patch of grass where there is a rare Pokemon. Chariza’s Rope becomes a rope from one side of the canyon to the other, so that you can walk over it to cross the canyon. A bridge could be made, so that everyone is able to go to the shrine more easily. Other Pokemon with the attack ‘Vine Whip’ or some sort of vines could also make a ‘vine bridge’. Flying Pokemon will also get you past the canyon. Combining the plateau with other quests. Putting a cave on the plateau. Chariza comes to the shrine every Saturday. Chariza: “My mother is feeling better. This will make your Pokemon feel better!” Item: +1 Potion. News & Announcements / ALERT! PU NEEDS MOTIVATION! Attention all fans and visitors. On behalf of the PU development team, I would like to apologize for the lack of updates over the past months, and would like to give something to you all. Unfortunately, it isn't the game, and I regret to say that our development team has dwindled down to a handful. There is a simple explanation for all of this: our level of motivation is down. Very few members are on at a time, and at most points, none at all. That is why I am calling a state of emergency for PU. I want everyone who still believes in this project to say so, and why they do. Give us stories of your times on this site, explain what you are excited for most. Especially let Mr Dark know. If it wasn't for him, and Urmel, this brainchild would not have gotten as far as it did, a lot of your favorite forum posters would not be here, and all the excitement for something different and new would never have existed. Also, feel free to post your own artwork, quest ideas, anything you can think of. This a game made by fans, for fans, and the only way that will be fulfilled is by letting you, the fans, show off your skills, or utilize the amazing world of the internet to get the word out that this project is on the verge of falling, and the few of us still holding on need a large amount of motivation. I for one don't want to see this project fail, and I know there are a lot of you out there that wish the same thing. Let's get this thing back on track. A great project needs your help more than ever, and there is a lot to do. We need mappers, artists, writers, battle experts, programmers, anyone with any creative skill or ideas. Post on Facebook, Twitter, Serebii, wherever you can think. We need support, we need to know that you all still want this, and are willing to help out any way you can. So I was exploring the internet when I found this little gem. Apparently, it takes pokemon and makes it more strategic. So far, this is a demo, but it's really fun, and the gameplay is amazing. Kind of a breath of fresh air, but PU will be better. I promise.